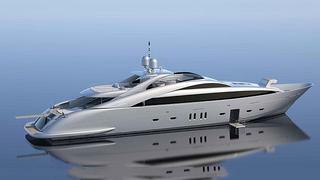 International Shipyards Ancona (ISA) announces a new order, its first 43.63m ISA 140 motor yacht featuring an hybrid propulsion system. The first ISA 140 follows the current trend to optimize performance and reduce fuel consumption. The solution was found in an hybrid propulsion system supplied by Siemens combining traditional and electric engines. The traditional side is powered by diesel engines with waterjets giving a top speed of 32 knots and a cruising speed of 26 knots. While under power, the electricity comes from two shaft generators on gearbox. At low speed (eight knots), main engines stop and waterjets are powered by electric ones with generators supplying power. This will reduce hours on both engines and generators, postponing maintenance deadline. It will also reduce consumption, gas emission, and noise level. Designed by Andrea Vallicelli, the ISA 140 looks like a large sister of the successful ISA 120 series. Made on a single mould, she becomes the largest composite hull produced by the Italian yard. The interior, by Nuvolari-Lenard, will accommodate 10 guests in five cabins. Already under construction, the first ISA 140 Hybrid motor yacht will be delivered in summer 2014.